The Mariinsky's The Sleeping Beauty has received its share of controversial press, not for the quality of the productions --for there are two-- but for the history behind them. When Sergey Vikarev's version debuted in 1999, it divided the Mariinsky troupe in two, those both for and against the work. The "original" which was adjusted by Konstantin Sergeyev for the Soviet audience in 1952, and now also known as the "1890" production due to its roots in Petipa's original, continues to rotate in the company repertoiire, while the Vikarev version has been quietly shelved. As part of the XVIII Mariinsky Ballet Festival, which returned this year after a one-year hiatus (due to the anniversary of Petipa), the company presented the Sergeyev "original" with billing that included Lauren Cuthberthson from the Royal Ballet, along with Xander Parish, who got his start early on at the Royal but has become a principal by climbing through the ranks at the Mariinsky over the past 10 years. Unfortunately the night before the performance, Cuthberthson, who was already on site in Petersburg rehearsing, fell ill and was unable to appear as planned. Soloist Olesya Novikova replaced her with less than 24 hours notice. Past experience dancing together meant that the Parish-Novikova combination was able to present a high level four-hour performance, despite the nerve-wracking pressure. Many have stated that Olesya Novikova may be the best Aurora on stage today. Novikova, whose coaches have ranged from Moiseeva to Vikarev himself, incorporates Old World nuance by adhering to some of the tenets from the French School of centuries pre-Vaganova, where elbows remain softly bent and low. Such port de bras build an image of the role as it was initially presented in Petipa's time. As such, in Novikova, one witnesses a Beauty of today but with the flavour of yesteryear. It might be enough in the West to claim that Novikova's technique is superior: exquisitely hyperextended legs finish her lines and a talent for balances proves useful (especially in this ballet littered with tests of balance). But it is in fact her attention to nuance in dramatic terms along with exceptional musicality that carry her through. Calm, unhurried gestures underscore her character's shyness, sharp accents of the head add liveliness to her variation, and an understanding of timing allows her room to play with the steps within the framework of the score. 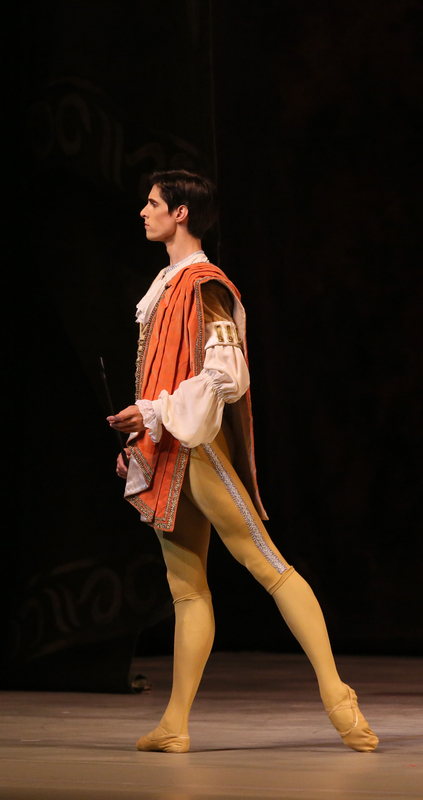 Xander Parish, now a principal and no novice in the role of Prince Désiré, is also blessed with an innately ballet body. An infinite plié with nearly idyllic chiseled leg muscles, and foot arches that any girl would envy that are the icing on the cake. Parish pays attention to the details of pantomime, whether towards his partner or others on stage. The sense of tragedy in Beauty's storyline is muted at best --the Prince must search for and find his dream girl, and cut through a forest of prickly vines riddled with bats to do it-- which doesn't give the hero a wide range of emotion to display. But what is present is done with integrity and depth rather than just lip service. Coaching by one of the Mariinsky's most reliable male coaches, Igor Petrov, has given Parish a strong arsenal in terms of both technique and stage presence. He easily darts through a series of tombé coupé jeté, with determination, and tours en l'air all have solid landings. Despite being thrown together at the last minute, the Parish-Novikova team proved to be the successful result of two professionals offering their best under high-pressure circumstances. The rest of the cast was not far behind. Ekaterina Kondaurova may be considered an iconic Lilac Fairy for her grace and ability to execute legato movements required from the numerous adagio sections. In contrast, the malevolent Carabosse, performed expertly by Islom Baiumuradov, seeping with evil and hunched over in her (his) black cape. In contrast to the previous sets of the Lilac's retenue, all of the fairies during this performance were new faces save for two: Ekaterina Petrova and Valeria Martinouk, who performed the Bravery and Canary fairies, respectively. They proved the most impressive of the group. Of the gemstone fairies, only Daria Ionova provided pure delivery as the Gold Fairy. Indeed her prominent casting during the festival suggests a bright future. For this performance, Valery Ovsyanikov conducted. Photos by N. Razina and V. Baranovsky, courtesy of the Mariinsky Theatre Press Office.